Leading Exporter of curcumin powder from Hyderabad. 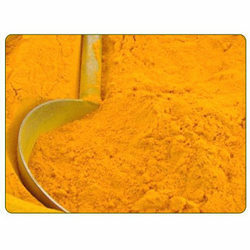 We are highly appreciated in the process of manufacturing, supplying and exporting of a wide range of Curcumin Powder. The offered range of powder is wide used in various processes and preparations. We have procured this curcumin range from the most comprehensive and reliable vendors. Obtained by solvent extraction of turmeric it is extracted by crystallization. Looking for Curcumin Powder ?